Now that Crimson Days is over for another year we thought it was time to give our honest opinion of what the live event felt like for 2019. I think it’s safe to say that while some changes were made to the gameplay of Crimson Doubles, the overall feel of Crimson Days has barely changes year-on-year. The event-specific Crucible playlist, Crimson Doubles, returned in full force with this year’s Crimson Days. The game mode was much the same as it has been in previous years, with Guardians being matched with one other, or joining as a pair, to fight off against two other Guardians. The elements of Crimson Doubles didn’t change much from 2018. If you were near your partner then you’d each receive a buff that boosted Super and ability energy regeneration. Stray too far and you’d lose that buff and become visible to your enemies, literally painting a target on your head that could be seen through walls. The flow of matches was short and sweet, with each one lasting only two minutes with an efficient pair. If the teams were fairly matched then a match could end with a tiebreaker, tasking one team with capturing a point. This was where matches got quite intense in my experience, and could lead to a frustrating end because of the lack of one mechanic. When a partner died in a match of Crimson Doubles they could not be revived. This meant that in a sudden death situation your partner is floundering on their own if you get shot. I thought that this was a bit harsh, since it basically made the point of capturing the area pointless. I’ve always loved Crimson Doubles, and this year still felt good despite the lack of revive capabilities. I will say that I managed to outrun two Guardians when my teammate lost connection at the point when we were ahead on score. I think this should have been impossible, but it was hilarious to think of my opponent’s frustration all the same. This year’s Crimson Days rewards were the same as last year’s, and that’s not a bad thing. Unlike other seasonal events Crimson Days is only around for a week, and that’s all the time you get to earn the rewards. The addition of purchasable rewards, including The Vow, was an extremely positive move by Bungie. The fact that this weapon was available at max Power Level so close to the beginning of the next season is also a huge positive for Crimson Days 2019. I only sat down in order to earn enough of the event currency, Confectionary Hearts, to buy The Vow, but I could see plenty of interest in it all the same. 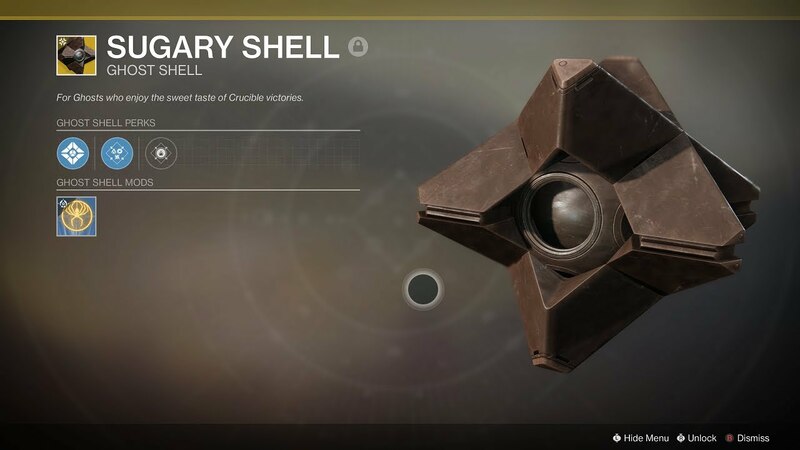 Completing every Triumph would also earn Guardians Sugary Shell, a very rare Ghost Shell. This looked amazing, and there were loads of other cosmetic items to earn throughout the event as well. Bungie also put on a special hoodie that Guardians could buy if they completed every Triumph. The last time something like this happened was for Destiny 1, and it was a great success then. As long as Bungie fulfil every order this will probably be a massive hit too. This year’s Crimson Days felt like it had been built on a little, but left largely unchanged. Given that it was such a fantastic event to begin with I don’t think this is a bad thing. Crimson Days is probably my favourite seasonal event in the Destiny universe, and I think that’s because it feels like something Bungie crafted themselves. While the developer has said that this year’s Annual Pass roadmap will be the content we see come to the game, I think we’ll see some bigger changes to things like Crimson Days as we get closer to September. Let us know your thoughts on Crimson Days 2019 in the comments. Is Skyburner’s Oath The Best Exotic Scout Rifle?